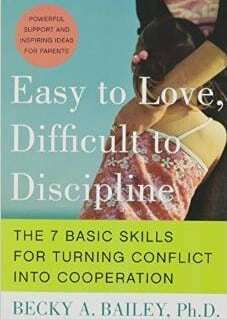 “Easy to Love, Difficult to Discipline” is Dr. Becky Bailey’s parenting book. It doesn’t have the research or specific examples that Conscious Discipline provides, so while it is a helpful and respectful resource for families, we find that “Conscious Discipline” is a stronger resource. If you’re looking for a bit of a lighter and quicker read, “Easy to Love, Difficult to Discipline” is a good place to start and can serve as an introduction to the principles of “Conscious Discipline”. The seven skills outlined in the book are the foundation of the power shift that parents can make to dramatically change their relationship with their children. Choices, assertiveness, and positive intent chapters set a strong foundation for parents who are interested in a working-with approach to parenting. The book doesn’t outline the brain research and habit change that needs to happen the same way the teacher’s book “Conscious Discipline” does. “Easy to Love Difficult to Discipline” is of course much shorter than “Conscious Discipline” but it doesn’t share all the research.